Cyndi's List - This is a superindex of genealogy websites. FamilySearch - A search tool for the Church of Latter Day Saint collection of databases and microfilms. GenForum - A facility for searching surnames links on the Web. Henry County Research - Genealogical publications from Old Mill Printers that relates to Southside Virginia. RootsWeb.com - A facility for searching surnames links on the Web. SurnameWeb - A facility for searching surnames links on the Web. USGenWeb - Contains listings of various institutions for historical and genealogical research purposes. 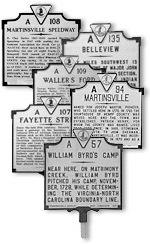 Bassett Historical Center - The Bassett Historical Center is the repository for all genealogical research and local history for the counties of Henry and Patrick and the City of Martinsville, VA.